Getaway from your daily hustle and bustle at BlackBeary Cottage; a cozy two bedroom, one bath cabin with room for six. Relax with your favorite book in a rocking chair, roast marshmallows by the fire, hike the Benton MacKaye Trail, or fish one of 6 stocked lakes. Within ten minutes you will be in the quaint town of Blue Ridge where you can enjoy fine dinning(Harvest on Main), take a ride on the Blue Ridge Scenic Railway, browse the many shops, or sample some local beer/wine. Or travel about fifteen minutes south to Ellijay, GA and visit the many apple orchards, taste some wine at Cartecay Vineyards, or explore some history at the Tabor House & Civil War Museum. A new winery Bear Claw has opened in Blue Ridge (Fall 2017) and is a short drive from the cabin. Within a short distance you can enjoy white water rafting, horse back riding, hiking trails, fishing, canoeing, tubing, and some beautiful mountain views. If you enjoy playing some slots on your getaway, the Harrahs Casino is about 30 minutes away in Murphy, NC. 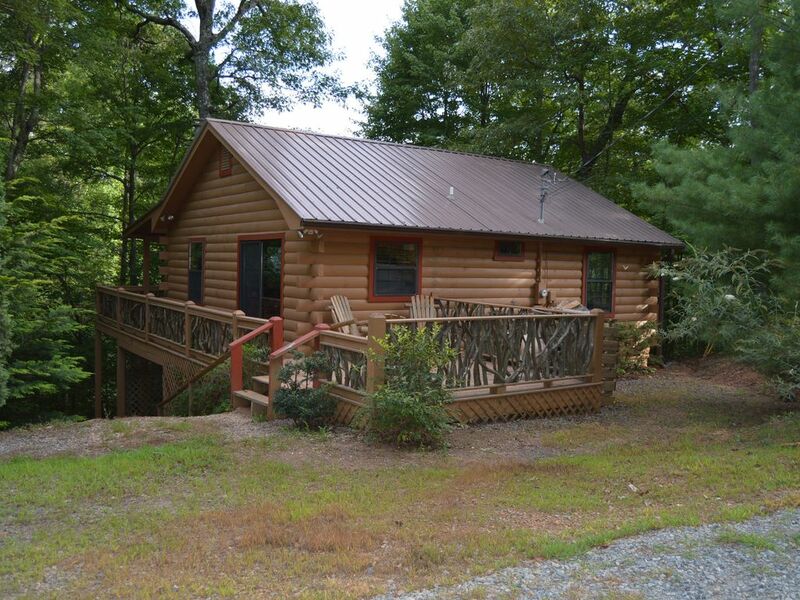 Although BlackBeary Cottage is a nice getaway to the mountains it has all the comforts of being at home: flat screen Sling TV, Netflix, wireless internet, fully stocked kitchen, gas fireplace, two bedrooms with queen sized beds, washer and dryer, and a propane grill. My wife and I grew up south of Buffalo, NY in a small farming town. Since starting our family we have wanted to give our children a taste of the country living we were able to experience. Cherry Log is the perfect spot for us to be able to make unforgettable memories with our children, family, and friends. We are excited to be able to share our home away from home with you and your family and hope you too will make memories that last a life time. We love how quite and peaceful the property is. You would never know it's only 10 minutes to Blue Ridge or Ellijay. Fully equipped kitchen with Oven, Microwave, and full size Refrigerator/Freezer. Coffee maker, toaster and all pots and pans needed for cooking. We have Sling for our TV service due to the Dish no longer providing service due to the growing trees. Very clean and nice! Beautiful setting in the mountains! Great weekend getaway and owner was awesome at accommodating us. Wonderful stay, my wife asked on the way home when we were coming back. Loved Cherry Log! This was the perfect cabin for the three of us and our dogs to stay. The views are gorgeous and there are endless things to do in the area. We took the dogs and our 6 year old son hiking every day and no matter where we went we were never disappointed. We all wish we could live on this beautiful mountain year round. Would love to go back soon. Glad you enjoyed the cabin and the hiking in the surrounding areas! Very comfortable for 4 people and our two small dogs. All the necessary items provided. Enjoyed the gas fireplace! New grill on porch was nice! Beds were a little soft but otherwise great stay! Close to groceries, hiking, vineyards, brewery. Everyone we met was so nice! Easy booking and check-in and out. Prompt replies and service. Cabin was really clean. Loved the area! Glad you enjoyed the cabin and your trip! The cabin was nice. There was a lot of traffic and loud teenagers across the road. Loved the gas logs and deck and porch. We made a fire on the deck and met a couple neighbors. Overall a very good stay. Glad your enjoyed the cabin! The cabin across the road doesn't book often. If you had let me know about the loud guests I could have sent the owner a message. While we welcome everyone to enjoy themselves in the mountains it's unacceptable to disturb others.